Please read the below press release to learn more about our first Women & Entrepreneurship Week. OXFORD, Miss.–A new week-long event is being hosted by the Career Center and Center for Innovation and Entrepreneurship (CIE) aiming to promote women working in entrepreneurship at the University of Mississippi starting on Nov. 14. Each event aims to coach students in professional development areas that impact women students with entrepreneurial aspirations. Cobie Watkins, director of student and alumni programs at the CIE, says her department has wanted to host an event for almost two years to demonstrate to women that entrepreneurship is a vibrant pathway to a career. More women are imagining themselves as business owners and entrepreneurs- almost 42 percent in 2015, up from 36 percent in 2012- and those numbers are continuing to grow according to Watkins. Richard J. Gentry, associate professor of entrepreneurship and strategy director, said that the CIE’s goal is to have students think about starting their own businesses and broadening their opportunities to become more innovative. “The job market today is much less stable than it was a generation ago,” Gentry said. “A primary mission of a college is to help students appreciate the range of employment opportunities for both small and large businesses. There are four events throughout the week that will each entail a different aspect of business. The first event is on Tuesday, Nov. 14 at 12 p.m. at the Overby auditorium and includes regional experts educating attendees on how to best market themselves in their careers. On Wednesday, Nov. 15 at 2 p.m. there will be a panel for personal branding and small business owners will be present for the discussion. 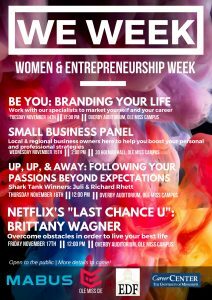 The final day, Friday, November 18, will feature Brittany Wagner from Netflix’s “Last Chance U,” where Wagner will discuss her success story. Thursday and Friday’s events will both be in the Overby Auditorium at noon. Each event will include door prizes such as two free nights at the Inn at Ole Miss along with manicure gift cards, jewelry and an assortment of other winnings. Watkins said a committee of six women ages 19 and up developed these events with the goal for the attendee to think about the challenges they face as women in their careers. The goal was to host events that would help others take a leap in creating a desirable future for themselves. “We took those ideas, and narrowed down the list, to showcase subject areas and speakers that would represent a multitude of viewpoints of women in their careers and women as entrepreneurs,” Watkins said. “The world of work is constantly changing and trends develop,” Cockrell said.